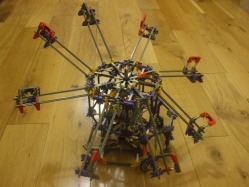 This is one of the most impressive knex models to watch. I think it is very well designed considering it only requires 1 motor to work. Become a ride operator and operate the octopus ride by changing the sequence. There are three modes which create different effects so try them all out. They are all explained in the video so they are easy to do. Anyway enjoy making this!